Download "Town Of Concord. APP #45 Telephone Procedures, Policies & Guidelines. 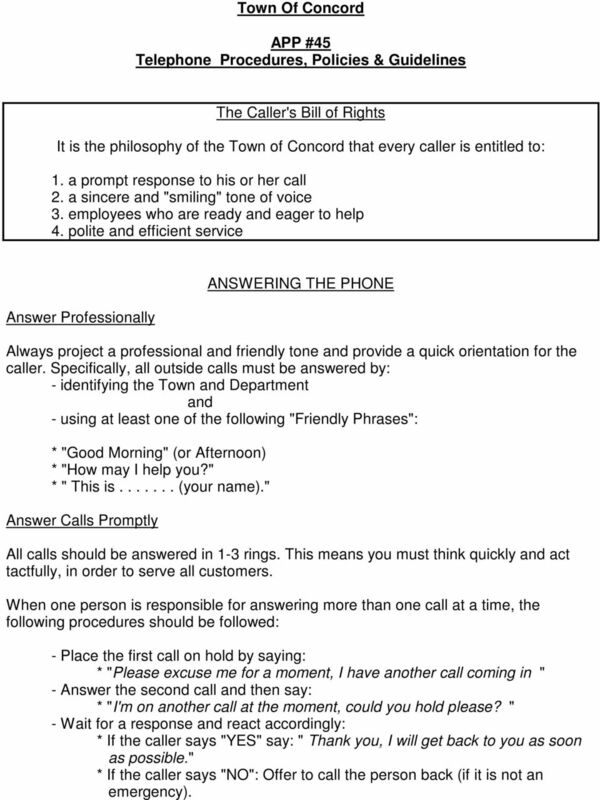 The Caller's Bill of Rights"
1 Town Of Concord APP #45 Telephone Procedures, Policies & Guidelines The Caller's Bill of Rights It is the philosophy of the Town of Concord that every caller is entitled to: 1. a prompt response to his or her call 2. a sincere and "smiling" tone of voice 3. employees who are ready and eager to help 4. polite and efficient service Answer Professionally ANSWERING THE PHONE Always project a professional and friendly tone and provide a quick orientation for the caller. Specifically, all outside calls must be answered by: - identifying the Town and Department and - using at least one of the following "Friendly Phrases": * "Good Morning" (or Afternoon) * "How may I help you?" * " This is (your name)." Answer Calls Promptly All calls should be answered in 1-3 rings. This means you must think quickly and act tactfully, in order to serve all customers. When one person is responsible for answering more than one call at a time, the following procedures should be followed: - Place the first call on hold by saying: * "Please excuse me for a moment, I have another call coming in " - Answer the second call and then say: * "I'm on another call at the moment, could you hold please? " - Wait for a response and react accordingly: * If the caller says "YES" say: " Thank you, I will get back to you as soon as possible." * If the caller says "NO": Offer to call the person back (if it is not an emergency). 2 * Return to the first call as soon as possible. 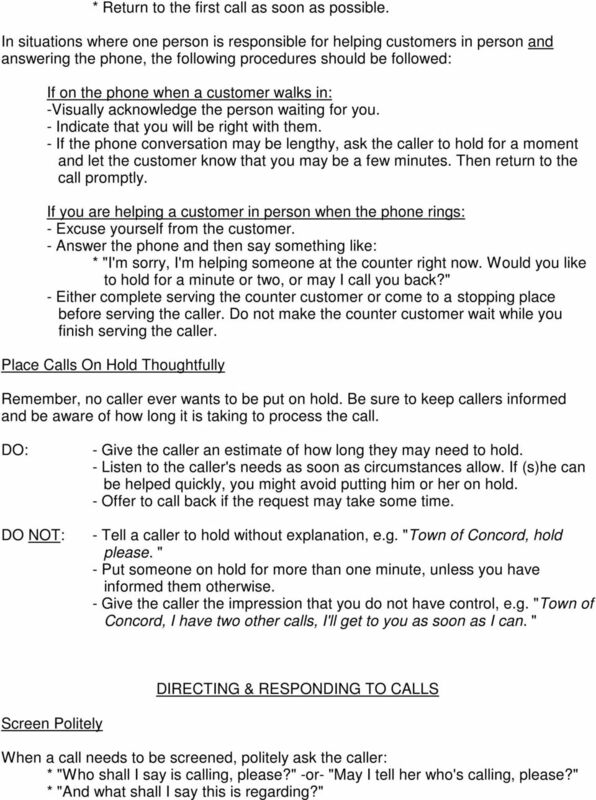 In situations where one person is responsible for helping customers in person and answering the phone, the following procedures should be followed: If on the phone when a customer walks in: -Visually acknowledge the person waiting for you. - Indicate that you will be right with them. - If the phone conversation may be lengthy, ask the caller to hold for a moment and let the customer know that you may be a few minutes. Then return to the call promptly. If you are helping a customer in person when the phone rings: - Excuse yourself from the customer. - Answer the phone and then say something like: * "I'm sorry, I'm helping someone at the counter right now. Would you like to hold for a minute or two, or may I call you back?" - Either complete serving the counter customer or come to a stopping place before serving the caller. Do not make the counter customer wait while you finish serving the caller. Place Calls On Hold Thoughtfully Remember, no caller ever wants to be put on hold. Be sure to keep callers informed and be aware of how long it is taking to process the call. DO: DO NOT: - Give the caller an estimate of how long they may need to hold. - Listen to the caller's needs as soon as circumstances allow. If (s)he can be helped quickly, you might avoid putting him or her on hold. - Offer to call back if the request may take some time. - Tell a caller to hold without explanation, e.g. "Town of Concord, hold please. " - Put someone on hold for more than one minute, unless you have informed them otherwise. - Give the caller the impression that you do not have control, e.g. "Town of Concord, I have two other calls, I'll get to you as soon as I can. " DIRECTING & RESPONDING TO CALLS Screen Politely When a call needs to be screened, politely ask the caller: * "Who shall I say is calling, please?" -or- "May I tell her who's calling, please?" * "And what shall I say this is regarding?" 3 NOT: * "Who's calling?"..... "What's this about?" Transfer/Announce Informatively Whenever transferring, announce the call and give all parties pertinent information: Tell the caller: - The name of the person or department to whom you are transferring their call. - The phone number to which you are transferring the call (if different from that which they called). * "You will need to speak to the Building Department for that information. I will transfer your call, but let me tell you their number in case you need to call again." 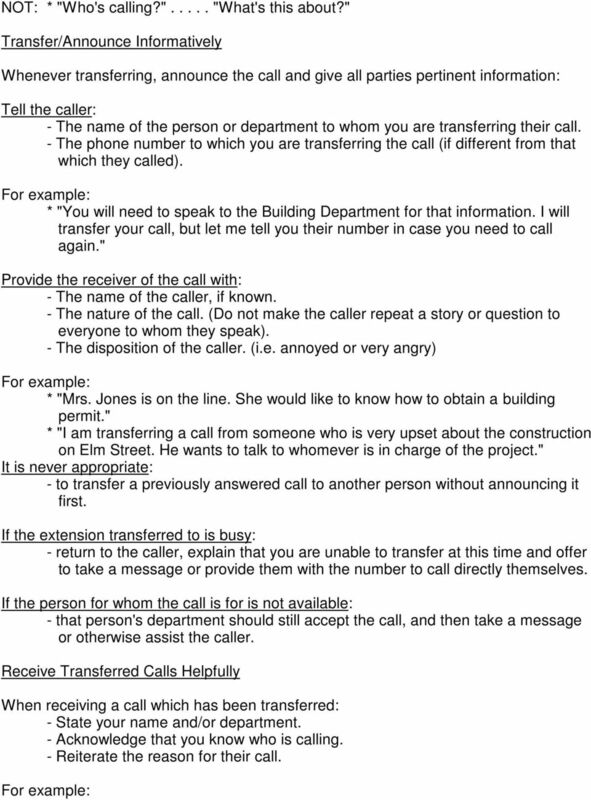 Provide the receiver of the call with: - The name of the caller, if known. - The nature of the call. (Do not make the caller repeat a story or question to everyone to whom they speak). - The disposition of the caller. (i.e. annoyed or very angry) * "Mrs. Jones is on the line. She would like to know how to obtain a building permit." * "I am transferring a call from someone who is very upset about the construction on Elm Street. He wants to talk to whomever is in charge of the project." 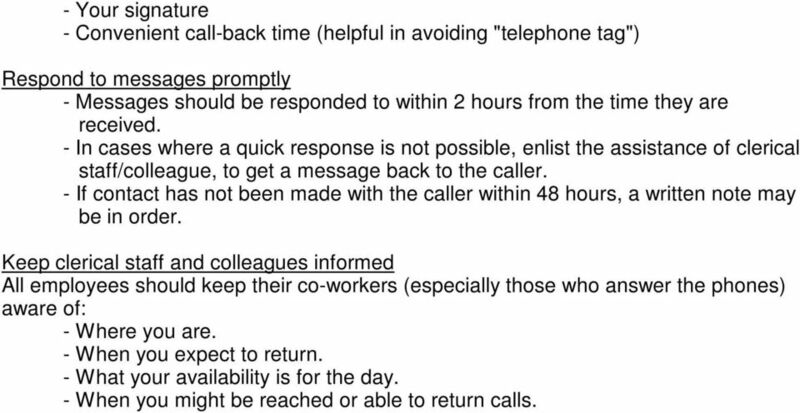 It is never appropriate: - to transfer a previously answered call to another person without announcing it first. If the extension transferred to is busy: - return to the caller, explain that you are unable to transfer at this time and offer to take a message or provide them with the number to call directly themselves. If the person for whom the call is for is not available: - that person's department should still accept the call, and then take a message or otherwise assist the caller. Receive Transferred Calls Helpfully When receiving a call which has been transferred: - State your name and/or department. - Acknowledge that you know who is calling. - Reiterate the reason for their call. 5 - Your signature - Convenient call-back time (helpful in avoiding "telephone tag") Respond to messages promptly - Messages should be responded to within 2 hours from the time they are received. - In cases where a quick response is not possible, enlist the assistance of clerical staff/colleague, to get a message back to the caller. - If contact has not been made with the caller within 48 hours, a written note may be in order. Keep clerical staff and colleagues informed All employees should keep their co-workers (especially those who answer the phones) aware of: - Where you are. - When you expect to return. - What your availability is for the day. - When you might be reached or able to return calls. Module :Telephone Etiquette Training for Healthcare Professionals Why are Telephone Etiquettes Important? Imagine, you call up the switchboard of an organization. You want to just reach out to your friend. FAIRFIELD PUBLIC SCHOOLS INFORMATION TECHNOLOGY DEPARTMENT STANDARDS OF EXCELLENCE Performance standards have been developed for all Fairfield Public Schools Technology Department team members to follow. To establish a procedure to carry out the uniform countywide customer service program. VOICE MAIL. Voice mail allows business professionals access to messages even when they're away from the office. Hello, my name is Jessica and I work in Human Resources for Target Corporation. University of St. Thomas Career Development Center Streaming Audio 4 Sections Interviewing Script Preparing for Interviews Hello, my name is Jessica and I work in Human Resources for Target Corporation. FOR LEADING. A book from the series Effective Communication by. T +33 (0)825 096 860 / +33 (0)4 42 320 000 contact@ecsplicite.com www.ecsplicite. 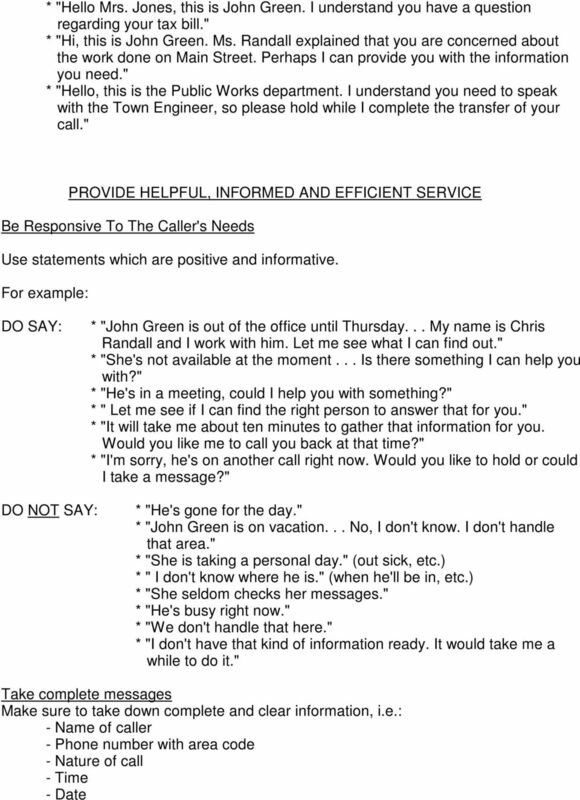 Quick Reference Instructions Verizon Home Voice Mail Your first step... ALWAYS GET INTO YOUR MAILBOX FIRST To do this from your home telephone, dial the Home Voice Mail system number, then enter your passcode.